-Estrogen figure 14-20 Model for the mechanism of action of prolactin. Modified from Aragona, C, and Friesen, H. G. (1979). Lactation and galactorrhea. In "Endocrinology" (L. J. DeGroot, G. F. Cahill, L. Martini, D. H. Nelson, W. D. Odell, J. T. Potts, Jr., E. Steinberger, and A. I. Winegrad, eds. ), Vol. 3, pp. 1613-1627. Grune & Stratton, New York. hormone receptor, belongs to the hematopoietic cytokine superfamily of receptors (see Figure 15-22). Specific prolactin receptors are located in mammary tissue, placenta, testis, prostate, seminal vesicles, and hypothalamus, to name a few. As yet, the signal transduction pathway to which the prolactin receptor is linked has not been identified. 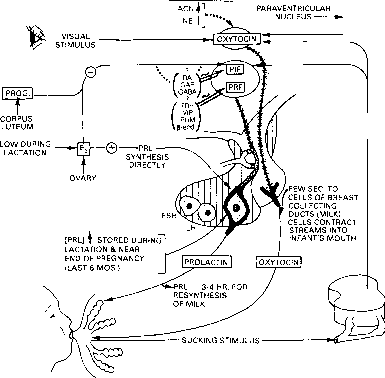 The regulation of prolactin release and its subsequent actions is diagrammed in Figure 14-21. Normally in the male and female the PRL serum concentration is 5-10 ng/ml or 0.2-0.4 nM; at this level PRL receptors in the mammary tissue are about half-saturated. 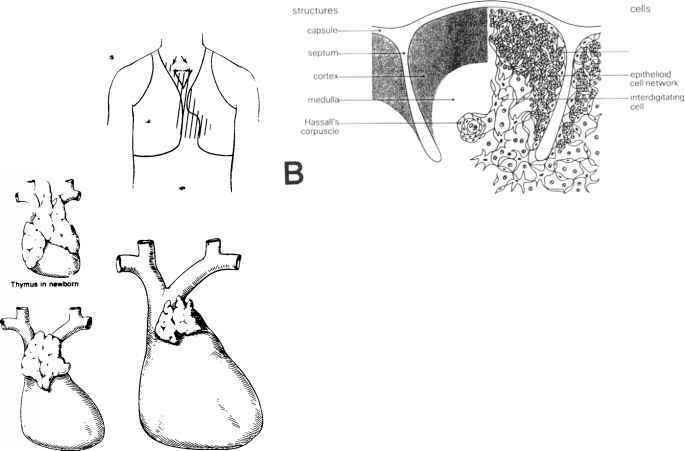 Starting with the hypothalamus (Figure 14-19), PRL is postulated to be released from the mammotrope by a pair of presumptive releasing factors, prolactin release inhibitory factor (PIF) and prolactin-releasing factor (PRF). PIF appears to be related or identical to dopamine (DA), which inhibits the secretion of PRL. The positive releasing factor, PRF, which may be identical to TRH (see Chapter 5 for structures of releasing factors), causes PRL to be released from the mammotrope of the anterior pituitary. Progesterone and estrogen inhibit the release of PIF (dopamine), thus increasing the secretion of PRL by diminishing a negative constraint. Estradiol acts indirectly on the mammotrope to effect the release. Apparently this is accomplished by the direct action of estradiol on the corticomedial amygdala of the limbic system, higher than the hypothalamus. Such an effect could subsequently act on hypothalamic releasing factors. In stress, /3-endorphin is produced via /3-LPH in the corticotrope and later stimulates the release of PRL at the level of the mammotrope. One of the end hormones in stress, Cortisol from the adrenal gland, also negatively feeds back on the mammotrope to inhibit further release of PRL. In lactation, a dominant overriding signal is the suckling nerve impulse, which travels through the spinal column, reaching the brain in a millisecond time frame, and stimulates the prompt release of PRF, which in turn acts on the mammotrope to release PRL. Such an effect could be delivered by serotonergic neurons and additionally by the stimulation of (3-endorphinergic neurons, which could also release PRL as shown by its effect in the stress mechanism. Figure 14-22 illustrates the episodic changes in plasma prolactin and oxytocin levels that occur as a consequence of the initiation of suckling. /SPINAL CORD LNEURAL ' PATHWAYS-SUCKING STIMULUS— BRAIN IN msec figure 14-21 Integrated model to describe the neuroendocrine control of suckling and lactation. Abbreviations: GAP, gonadotropin-associated peptide; PHM, peptide histidine methionine; VIP, vasointestinal peptide. This figure is redrawn in part from Ezrin, C., Godden, J. O., Volpe, R., and Wilson, R. (1973). "Systematic Endocrinology." Harper & Row, Hagerstown, MD. titis and infection in the mammary gland due to the stasis of milk. It has been used experimentally to determine whether mammary tumors, whose growth might be stimulated by PRL, could be regressed.